Near Ahousaht’s coast lies Sea Otter Rock, a fixation in the First Nation’s territory that serves as a reminder for the active mammal not to overreach its place in the surrounding ecosystem. Oral history recounts a time when the other animals gathered to discuss the sea otter’s gluttony after it became clear it was taking food from other creatures. “The sea otter was getting too greedy,” recounted Kiista, Keith Atleo, during a Council of Ha’wiih Forum on Fisheries in February. The animals took the problem to a chief, who then told the thunderbird what was happening. The thunderbird warned the sea otter to stop taking food from the other animals, but when the head otter refused to follow this directive, it was turned into a rock as a warning to the others. Observations along the central and northwest coast of Vancouver Island indicate that such an intervention might be necessary again. After the animals reached extinction in the region a century ago, the introduction of 89 otters from Alaska between 1969 and 1972 has grown to over 4,000, a population surge that has affected other species. Saqᵂistl, Hilda Hanson, is an elder with the Kyuquot/Cheklesaht Nation. Over her lifetime she’s seen a supply of shellfish that the Kyuquot community once fed upon disappear due to the resurgence of sea otters. In Tla-o-qui-aht territory, the community has seen otters rid the area of sea urchins, or t’ucup in Nuu-chah-nulth. Further down the coast, Hup-in-Yook (Tom Happynook), the Huu-ay-aht’s traditional whaling chief, hasn’t seen sea otters return to his First Nation’s territory yet. But the situation in Kyuquot is worrisome. “We are concerned; we’re waiting for them to arrive,” he said. These comments have helped to inform Coastal Voices, an ongoing research project investigating the social and ecological changes triggered by the recovery of sea otters on the West Coast, from Alaska to Vancouver Island. 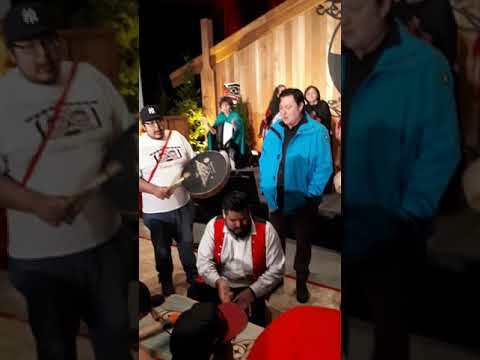 The project is guided by a steering committee of Nuu-chah-nulth, Heiltsuk, Haida and Sugpiaq hereditary chiefs and knowledge holders, working with the nations and researchers from Simon Fraser University. Using traditional knowledge and Western science, the goal of Coastal Voices is to collect information that brings respectful dialogue to help communities deal with the return of sea otters. Since it launched in 2013, the project has been funded by Pew Charitable Trusts, a non-government organization that finances research around the world. As a keystone species on the West Coast, the sea otter has proven to significantly affect the coastal territories where it lives. With a metabolic rate two to three times faster than land mammals of a similar size, the sea otter is a voracious hunter, consuming up to 30 per cent of its body weight in a day. For an adult male that could be a daily diet of nearly 15 kilograms of food, an appetite that benefits from the animal’s ability to dive 30 metres deep, with dexterity capable of using rocks as tools to break open shellfish. The otter’s effect on the surrounding ecosystem is evident through the rapid decline of their preferred prey, including sea urchins (t’ucup), crabs, clams, mussels and other shellfish. Jenn Bert, an SFU marine ecologist leading the research project, recalled seeing an area on the coast of Vancouver Island transform in one year due to otters. Oral history and archeological findings show that sea otters existed throughout Nuu-chah-nulth territory for thousands of years. Remains discovered in the refuse heaps of ancient village sites indicate the importance of sea otters to the everyday life of Nuu-chah-nulth-aht. “If you look at those shell middens and you count the relative number of otter bones, you can see that in some places a lot of otters were landed, they were hunted and in high amounts,” said Salomon. Sea otters have the thickest fur of any sea mammal, protecting the skin from even getting wet if an animal is healthy. This brought a connotation of high status, and when visitors came into a Nuu-chah-nulth nation’s territory, they were often greeted by the ha’wilth wearing otter fur, signifying the richness of a community. Otter fur became a sought after commodity after Captain James Cook first landed in Yuquot in 1778. Trade with Europeans and Russians quickly intensified, and overhunting eventually led to extirpation by the early 20th century on Vancouver Island’s west coast. Downgraded from “endangered” to “threatened” to the current listing as a “species of special concern” under Canada’s Species at Risk Act, otter management plans currently prohibit hunting practices the Nuu-chah-nulth once employed to control the population of the species. But across the border in Alaska, where the otter population is estimated at over 79,600, the situation is quite different. There a provision in the US Marine Mammal Protection Act allows Alaska’s Indigenous Peoples to hunt otters for subsistence, traditional handicrafts and clothing. Burt observed that many Indigenous people in the northern state felt that hunting allowed them to keep their ancient traditions alive. The inability to legally exercise population control through hunting was a foremost frustration for Kyuquot residents struggling with living alongside the energetic sea hunters, recounted Burt. In February Coastal Voices was granted permission from Nuu-chah-nulth ha’wiih to continue researching how to maintain productive shellfisheries with a viable sea otter population. Over the coming years the need to identify ecologically sustainable and socially just hunting practices is destined to become a focus for the project. For some in communities that have been on the coast for hundreds of generations, part of the solution includes lies in reintroducing simple practices.